The team fights to retake control of Atlantis when Michael infiltrates the control room to take Teyla's child and destroy the city. Trying to get her baby, Torren, to sleep, Teyla Emmagan walks the corridors. On the east pier, she is nearly run over by radio-controlled cars Dr. Rodney McKay and Lt. Colonel John Sheppard are racing. Once Torren nods off, she returns to her quarters, placing him in his crib. As she does so, the power and communications go out. Trapped, she lights candles. Suddenly, her door opens and two men enter. One raises a weapon and stuns her. Still competing when the power goes out, Sheppard and McKay see that only the control room is lit up. Near the locker room, Sheppard grabs flashlights and walkie-talkies. He orders Rivers to round up other Marines and notify him if anyone sees Richard Woolsey, the base commander. McKay sends Radek Zelenka to the main power room to attempt a system reboot. Meanwhile, Sheppard and McKay begin to climb the stairwells to level 35. Zelenka reports that the Z.P.M. and naquadah generators were disabled from the control room. As Sheppard and McKay start for level 63, McKay suggests using the auxiliary battery unit to power the mainframe and a few transporters. When they finally do reach the stairwell to the gate room, they find the door sealed. When Zelenka restores power to McKay’s lab, Sheppard, McKay and Major Lorne head there. They are locked out of all critical computer systems, but Sheppard suggests accessing the surveillance cameras. There is a Puddle Jumper in the gate room and unidentifiable men at the consoles. In Woolsey’s office, they see that Torren asleep on a chair and Teyla … as Michael enters the room. 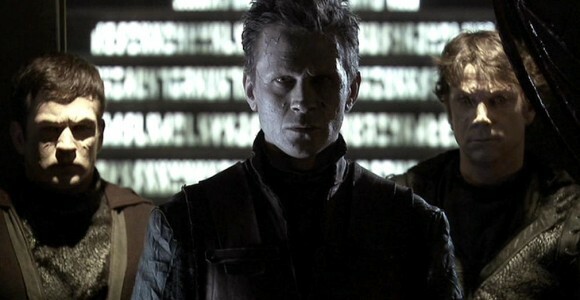 The Wraith hybrid and enemy of Atlantis used the Puddle Jumper that Sheppard flew onto his cruiser (“Search and Rescue”) to hack Atlantis’s security codes. Now his hybrids are attempting to arm the city’s self-destruct mechanism. Michael wants Torren, as he is the key to perfecting his hybrids and securing his reign over the galaxy (“The Kindred”). Because of her kindness at one time, Michael wants Teyla to accompany him and Torren. Knowing who the enemy is now, Sheppard and Lorne prepare to retake the gate room. They blow the doors off the stairwells with C4, but a force shield generated by Michael’s Jumper blocks access to the two levels above and two below the Stargate and the control room. They can’t fire a drone into the room because there isn’t enough power for the chair. And the Jumper bay is within the force shield bubble. Sheppard remembers two disabled Jumpers in the underwater bay, which McKay was supposed to have fixed by now. But he admits he hasn’t gotten around to them yet. As Sheppard and McKay head there, a stunned Ronon Dex awakens. Woolsey had just given him a digital voice recorder for mission reports when the Jumper with Major Nelson’s I.D.C. called in early. Woolsey nonetheless ordered the shield lowered. When Michael’s Jumper came through the Stargate, everyone in the tower was rendered unconscious by a stun pulse. Ronon tries unsuccessfully to open the door of the room where they are trapped. When technician Amelia Banks regains consciousness, she hot-wires the door open. Ronon attacks the hybrid guard. Banks shows off her kickboxing skills, keeping the hybrid busy until Ronon can stun him. When Woolsey rouses, they decide to go to the armory. En route, Ronon overhears a hybrid tell Michael that they have broken the encryption on Atlantis’s self-destruct. Sending Woolsey back, Ronon and two others shoot their way into the control room. Michael attacks Ronon and as they struggle, Ronon tells Teyla to make a run for it. She and Woolsey flee to a stairwell, but the force shield blocks their way. When Woolsey is injured, Teyla and Torren hide inside a power conduit chamber in the corridor wall. Still fighting with Michael, Ronon is flipped over a balcony and knocked unconscious when he hits the steps below. Enraged, Michael arms the self-destruct. He calls to Teyla over the city intercom, and tells her that he will spare Atlantis if she and Torren come with him now. Teyla is torn, but chooses to remain hidden. Hearing the self-destruct klaxon sounding, McKay manages to gets one of the broken Jumpers flying — but it has no weapons. Sheppard plans to crash it into the tower to stop Michael’s escape. But Zelenka radios and tells the two that he can now lower the Stargate’s shield. McKay tells Sheppard to fly the Jumper to gate level, and then use the on-board D.H.D. to dial the gate. The kawoosh will destroy Michael’s Jumper and disable the force shield keeping them out. Sheppard instead orders McKay to do this, while he leads the strike team into the control room. With less than two minutes left until the city explodes, Teyla radios Michael and tells him to disarm the self-destruct. He declines, since he already has taken a sample of Torren’s DNA. It is not as ideal as having the baby himself, but he will manage. Michael is not willing to give up the city’s destruction — his final revenge for what they have done to him. As he and the hybrids return to their Puddle Jumper, Michael pauses at the steps to kill the still unconscious Ronon. But before he can, Rodney dials the gate and the Stargate’s activation destroys most of the enemy Jumper. Michael escapes injury and flees into the Jumper bay. He is shot, but continues upward to an outside parapet — with Sheppard in pursuit. Teyla hands Torren to Banks and follows them. The men fight, with Sheppard going over the edge. He regains his footing and he and Michael continue trading blows. Teyla arrive to help, joining in hand-to-hand combat with Michael. Michael falls over the ledge, and dangles from the outside of the tower. With a stern look of finality, Teyla kicks his hands off the ledge, sending Michael plunging to his death below. Later, in the infirmary, Ronon hands Woolsey the voice recorder with his mission report. It is four lines long. Almost grateful for that, a bandaged Woolsey heads for his quarters. Late that night Teyla again walks with Torren, who is wide awake. She finds Sheppard and McKay racing their cars again. This time, at last safe from the threat of Michael, they stay to watch. “With Michael’s and Teyla’s relationship — that was such a crazy and wonderful journey. My character was, at least in the beginning, truly sympathetic to his plight. And yet here was this man, creature, or whatever who was for all intents and purposes a Wraith, and therefore an entity who decimated her people. That was quite compelling to play, and something that carried through to the end where, sadly, there was absolutely no love loss, certainly for Teyla, when it comes to Michael. VOTE! How would you rate Atlantis's "The Prodigal?"